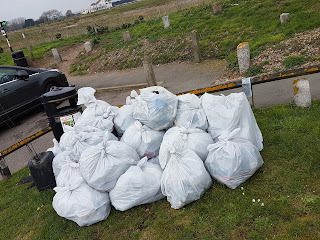 Massive thank you to everyone who volunteered their time on todays Deal Beach Clean - this was part of #BigSpringBeachClean a national initiative by Surfers Against Sewage of 570 beach cleans involving 30k people around the country this weekend. It was also start event for Plastic Free Deal week. We think there was some 120 people who collected an amazing 164kilos of rubbish mainly avoidable single use plastic. Thanks to organisers Rose, Ian, John and Steve. I was great to see local scouts, volunteers from Sandown Castle Community Garden and fantastic turnout from A Company Kent Army Cadets.